Calluses and corns are areas of thick, hardened, dead skin. They form to protect the skin and body structure under the skin from pressure, friction, and injury. They may appear grayish or yellowish, be less sensitive to the touch than surrounding skin, and feel bumpy. Calluses on the hands and feet of an active person are normal. Calluses and corns become a problem when they grow large enough to cause pain. Calluses generally form on the hands or feet, although they may form wherever there is pressure on the skin, such as on the knees or elbows. Calluses on the hands generally form at the base of the fingers. They usually are not painful and may be useful. For example, a carpenter might develop calluses that protect his or her hands from scrapes and cuts while working. A tennis player might develop calluses on the palm that protect his or her hand from the pressure and friction of handling a tennis racket. Calluses on the feet generally form on the ball of the foot, the heel, and the underside of the big toe. They often form where the foot and the beginning of the toe meet (under the end of the metatarsal bone. Corns generally are found where toes rub together. Corns have an inner core that can be soft or hard. A soft corn is found between toes (usually the fourth and fifth toes), while a hard corn is often found over a bony part of a toe (usually the fifth toe). 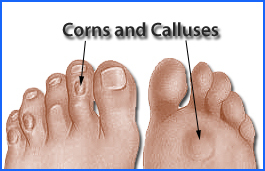 The symptoms of calluses and corns include pain while walking or wearing shoes and difficulty fitting into shoes. Any type of pressure applied to the callus or corn, such as squeezing it, can also cause pain. However, calluses and corns often are not painful. You can tell you have a corn or callus by its appearance. A callus is hard, dry, and thick and may appear grayish or yellowish. It may be less sensitive to the touch than surrounding skin, and it may feel bumpy. A hard corn is also firm and thick. It may have a soft yellow ring with a gray center. A soft corn looks like an open sore. Our orthotic insoles redistribute the weight evenly across the foot, eliminating any friction or excessive pressure on the feet. This alleviates the pain and allows the calluses/corns to heal.